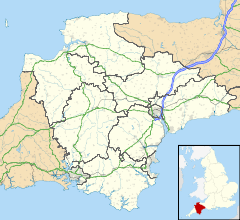 Newton Poppleford is a large village situated on the A3052 road between Exeter and Sidmouth on the west side of the River Otter in East Devon, England, within the East Devon AONB. Newton Poppleford is twinned with Crèvecœur-en-Auge in Normandy, France. The village is on the route of a Roman road from Axmouth to Exeter. It includes some whitewashed cob thatched cottages, one shop and St Luke's Church which was founded in 1331 (with the current structure dating from 1897). The town contains a village hall, primary school and sports pavilion. There was also a church hall, however it was burnt down in 2012 due to arson. A carnival procession used to travel through the village in the autumn, although this was stopped in 2014. Newton Poppleford railway station closed in 1967 and was subsequently demolished. The surroundings are known for market gardening because of the excellent soil quality in the area. A variety of daffodil (the King Alfred) was originated in the village and received an award from the Royal Horticultural Society in 1899. This renowned flower, with its large colourful trumpets, was first cultivated in the house of 'The Gardens' and premises, which is found in the centre of the village. It is one of the oldest houses in the village, dating back to the 15th Century, with cob walls and thatched roof with a quaint brook (small tributary) passing through the garden joining the River Otter. There are also fruit farms nearby. The name Newton Poppleford means 'The New Town by the Pebble Ford.' It was originally settled by the Saxons and founded as a 'new town' in the 13th century by the Lord of the Manor of Aylesbeare. He was granted the right to hold a market, which was originally sited at the centre of the town. The East Devon Way path passes close by. Questions and answers for the many British editions of the board game Trivial Pursuit were written at Bowhay Cottage in Newton Poppleford for 25 years by Brian Highley. The Newton Poppleford Local History Group formed in 2014 to record and document local history and memories of local people. Their website can be seen at newtonpopplefordhistory.wordpress.com Contributions of photos, documents, memories etc, will be very welcome. Newton Poppleford is the principal settlement in the civil parish of Newton Poppleford and Harpford, which is surrounded clockwise from the north by the parishes of Ottery St Mary, Sidmouth, Otterton, Colaton Raleigh and Aylesbeare. The parish also includes the smaller settlements of Harpford, Burrow, Southerton and Venn Ottery. The population of the parish is 1,692, which increased to 1,715 at the 2011 Census. Newton Poppleford was historically a chapelry in the ancient parish of Aylesbeare, and became a civil parish in 1898. In 1935 the civil parish was abolished and added to the parish of Harpford, together with the smaller parish of Venn Ottery. In 1968 the parish was renamed Newton Poppleford and Harpford. The electoral ward is Newton Poppleford and Harpford whose total population at the above census was 2,095. Harpford Common and Harpford Hill lie in the west of the parish, although Harpford village is east of Newton Poppleford. These areas were historically part of the ancient parish of Harpford. Men in the Newton Poppleford and Harpford ward had the fourth highest life expectancy at birth, 89.4 years, of any ward in England and Wales in 2016. ^ "Parish population 2011". Retrieved 24 February 2015. ^ "Imperial Gazetteer of England and Wales". 1870. Retrieved 16 November 2014. ^ "Newton Poppleford and Harpford ward 2011". Retrieved 24 February 2015.